Secretary of State Matt Hancock will set out plans to give 3.1 million health and care staff in England a voice in the day-to-day creation of policy. He is launching a new digital platform called ‘TalkHealthandCare’, which staff can use to post ideas, questions and challenges for government. The platform will be available on computers, phones and tablets. It will continually update to reflect the views and ideas of staff. The platform will also include events, forums and webinars for staff across the country. TalkHealthandCare has been launched following feedback from staff that too often they do not feel valued at work. In particular, the Secretary of State has expressed concern about the high number of reports of bullying and harassment. He has reiterated his wish to ensure these issues are not accepted and ‘put in the too difficult pile’. To help protect paramedics from violence and increase prosecutions, the Department of Health and Social Care announced earlier this year that, as part of a pilot, body cameras would be issued to ambulances and paramedics. NHS employers are also introducing fast-access systems to speed up access to free mental health support and physiotherapy for their staff. While NHS England and NHS Improvement are developing more ways to prevent and reduce violence against health and care staff, TalkHealthandCare will seek views on what needs to be done to make staff feel safe and secure at work. "Millions of hard-working health and care staff turn up to work every day to meet any challenges tirelessly, with unending compassion. But they don’t just do this for money or other contract benefits. They do it to improve and save the lives of countless strangers, and in return it’s only right that they are valued, supported and developed. "But too often health and care employers, despite the NHS being the world’s fifth largest employer, don’t get this right. It’s time we hear from health and care staff about what they really have to say about the jobs that are at the heart of this country. 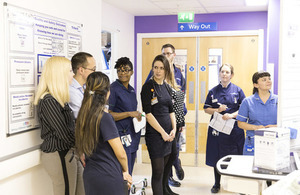 "Nobody knows what needs improving more than hard-working staff themselves, so my message is clear: we are listening to you, we want your views, and we will use them to ensure the long-term plan for the NHS helps you." "The celebrations around the NHS 70th anniversary showed again just how much the public value NHS staff. Listening to the views of the frontline and understanding what matters to them will help us design a long-term plan that delivers for the public and makes the NHS a great place to work."